A few weeks ago, our Civil Air Patrol members participated in a training session at the Mandan Airport. As it turned out, the weather wasn’t much good for flying and the cadets who were scheduled to get orientation rides were disappointed. Looking out the window of the aircraft in the image above, the weather doesn’t look so bad. However that image isn’t “real life”. Oh yes, it’s the Mandan Airport runway 13 alright, but the Cessna 172 aircraft depicted is part of a complex motion flight simulator called RedBird. Note the three windshield segments are really computer display monitors. The control panel below is mostly software driven and can be easily modified to simulate several different model aircraft. 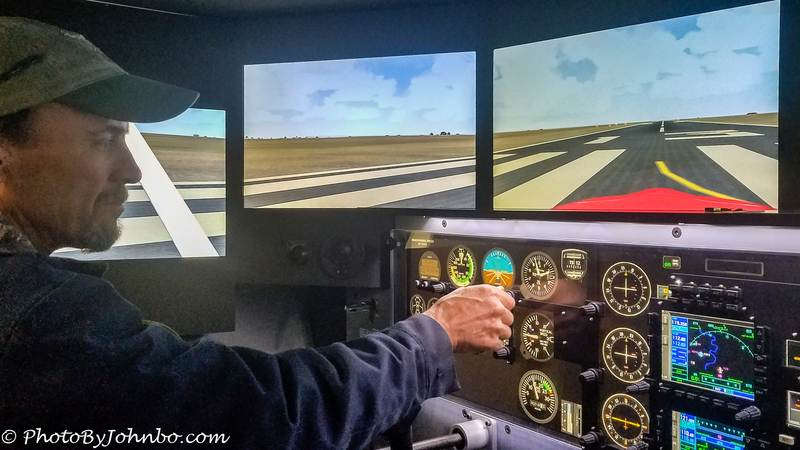 The simulation is real enough that pilots who train in the simulator can actually log the time toward instruction. The unit costs in the neighborhood of $90,000. That’s a pretty lofty neighborhood, but on the other hand, the hourly cost of operation is minimal. Pilots who use the trainer pay an hourly fee that’s one-third or less than the cost of renting a real aircraft. As you can see by this photo, there are side windows as well as the windshield in front. Mike Williams of Clear Skies Aviation gave us a demo and allowed some of the pilots to take it around the patch. Flying a simulator isn’t the same as flying the real thing, but they are great procedure trainers. The RedBird even feels like a real aircraft in that it moves as you fly it giving your senses the realistic feel of flight operations. About the photos: These are both snapshots captured by my Samsung S7 cell phone. I did nothing extraordinary for processing these images captured to give you a view of a modern flight training simulator. They’ve come a long way from the old Link Trainer, a motion simulator that was operated without any outside views for learning instrument flying in the clouds. In most browsers, you can click on the image to enlarge it and get a more detailed view. 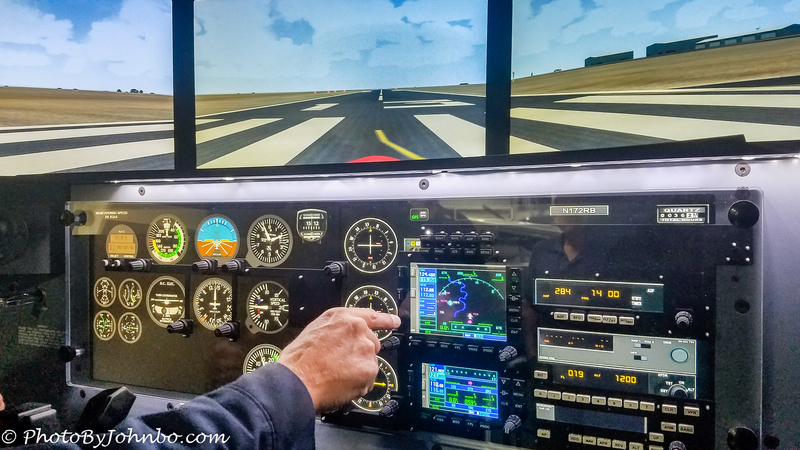 It was fun to fly with the “instructor” varying the weather from a summer weather takeoff to a change to winter snows and a howling wind… Truth is, they simulate flying, but control inputs aren’t totally realistic. Still, it was fun to fly.